Avro Vulcan B Mk 2 XM603 was completed at Woodford on 15th November 1963, fitted with Bristol Siddeley Olympus 301 engines. She first flew in the all white anti-flash paint scheme used for the high altitude role that the Vulcan was originally designed for. Delivered the same month to No. 12 Sqn, then part of the Coningsby Wing which moved, shortly afterwards, to Cottesmore in 1964. XM603 then transferred to the Waddington Wing in 1968, joined 50 Sqn in August 1975 followed by 101 Sqn in December 1980 & then 44 Sqn. in July 1981. By this time the paint scheme had changed to the Grey/Green camouflage used in the low level role which the Vulcan was now used for. She travelled extensively to British and American bases round the World before being retired by the RAF in 1982 as part of the general removal of Vulcans from service, just missing the Falklands conflict. 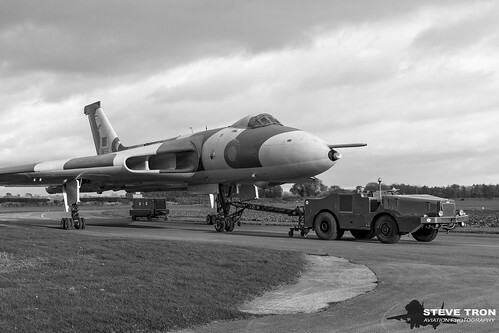 XM603 was sold to British Aerospace (as was) for preservation at Woodford. She arrived there on 12th March 1982 flown by Charles Masefield – now Sir Charles Masefield. She was used as the trial mock up aircraft for the Vulcan K.Mk 2 tanker conversion. Vulcans were used for air to air refuelling in Europe allowing the Victors to be used in the South Atlantic. A number of items were also removed to support operational Vulcans. After the team maintaining her were stopped accessing the airfield she started to decay and suffered some vandalism. XM655 at Wellesbourne now has two of her engines and still performs taxi runs. Recently restored to top static condition XM603 is the only preserved Vulcan in the all-white colour scheme.